Chief Poundmaker’s items have temporally returned home. This past July, for the first time since 1885, several personal belongings of Chief Poundmaker came back to the community where they were taken from more than 100 years ago. Poundmaker’s Winchester gun and his staff went on display at Poundmaker Museum, located approximately 175 kilometres northwest of Saskatoon at Poundmaker Cree Nation. Chief Poundmaker was 19th century Plains Cree chief who was convicted of treason and imprisoned after the 1885 North-West Resistance. He passed away shortly afterward his release from prison. Many of Poundmaker’s belongings were taken and ended up in museums around the world. Prior to 1885, the shortage of bison and broken Treaty promises of food rations and agricultural implements left Poundmaker’s people starving. According to Wikipedia, Poundmaker and his band members tried to get help for his people by traveling to Battleford to ask federal agents for food. However, when news of their arrival spread across the community, terrified settlers and the Indian agent fled inside Ford Battleford. During this time, the town of Battleford was looted, however, accounts of whether who was responsible differ. After being refused to speak to the Indian agent, Poundmaker and his band members went back to their reserve. Favel initiated the process of temporarily bringing these items back, with the long-term intent that the museum can repatriate these and other items held in other areas of the world. On July 18, 2017, the Poundmaker Museum and Historic Site re-opened with the unveiling of Poundmaker’s returned belongings and with the presence of dignitaries and Elders who spoke of the history of the resistance of 1885. The Poundmaker Museum received funding from SaskCulture’s Museum Grant Program and worked with Parks Canada, the Manitoba Museum and Fort Battleford to secure the loaning of Poundmaker’s belongings. “Having Poundmaker’s objects back allows us to once again own our own history and cultural artifacts and to interpret our own history in our way, not in the standard Canadian manner, which has proven itself to be incorrect or very biased on many occasions. To have reconciliation, we must approach each other in a place of equality,” adds Favel. 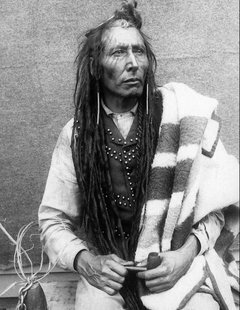 * Historical information on Poundmaker was found on https://en.wikipedia.org/wiki/P%C3%AEhtokahanapiwiyin and http://www.cbc.ca/news/canada/saskatoon/poundmaker-artifacts-saskatchewan-museum-exhibit-1.4191865.